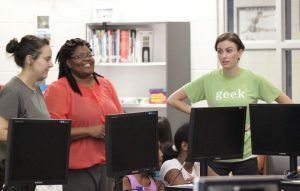 Cari DelMariani (right), Director of Programs for Kramden Institute, works with Selma Middle School Teacher of the Year Tarsha Johnson (center) and Kramden Institute office manager Kristina Zuidema (left) to train students on how to use their new computers. More than 30 students who attended enrichment programs this summer at Selma Middle were awarded personal desktop computers. The computers were donated by the Kramden Institute, a Durham non-profit organization that provides technology tools and training to students without a computer in their home. Tarsha Johnson, a Selma Middle teacher and President and Founder of Reaching Every Adult and Childhood Hardship (REACH) Our Communities, nominated the students who participated in the summer enrichment programs to receive a computer from the Kramden Institute. Representatives from the Kramden Institute and volunteers from REACH Our Communities were at the award ceremony on Friday to teach the students and their families how to use their computers. “It’s important to have a computer at home, so that I can learn all year and not just at school,” said Malachi McDuffie, a rising seventh grade student at Selma Middle. Robyn Hartless, a rising sixth grade student at North Johnston Middle, agreed with McDuffie about the importance of having a computer at home. Having received a computer from the Kramden Institute last year, Hartless said it helped her develop her math and reading skills. According to Johnson, the computers will impact more than just the students who received them Friday. Summer enrichment camp participant Raymond Andress prepares to take his new computer home. She estimated that roughly 150 students from across the county will benefit from the donation. The computers came pre-installed with more than 60 programs for the students to use, and tech-support from the Kramden Institute as long as the child who received it is a student. 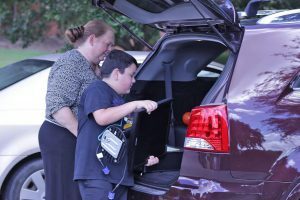 “We make sure the students know how to use all the programs on the computers, so that they can fully use their new technology when they get home,” said Cari DelMariani.